It is that time of year when you go into the loft and get your Christmas lights out. Once you have finished untangled them why not turn them in to smart lights and control them from Amazon Alexa. I can say “Alexa, turn on Christmas tree lights” and my tree lights turn on. I have also setup Alexa routines which can combine actions together so I can say “Alexa, it’s Christmas” and it turns on my tree lights, outside lights and light up reindeer. I can also say “Alexa, cancel Christmas” and it turns everything off. All you need is a smart plug and an Alexa. For the smart plug there are plenty on sale and this year I tested a TP-Link HS100 which costs around £28 and D-Link DSP-W115 costs around £29. It does not really matter which one you use as they both do the same things, checkout my reviews to see which is best for you. 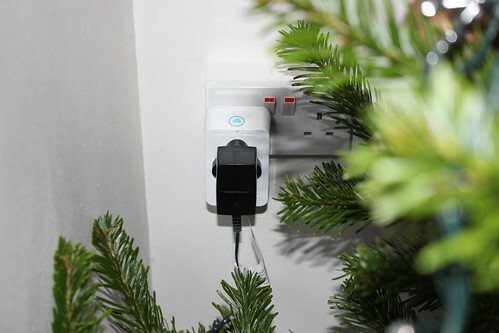 To get setup plug your Christmas lights into your smart plug and name the plug in your app appropriately (e.g. tree lights, reindeer) and make sure you link your smart plug’s manufacture skill in the Amazon Alexa app. Once linked you can ask Alexa to discover devices and then they should be available in Alexa, you should be able to say “Alexa, turn on Christmas tree lights”. If you have multiple devices, you can create a routine in the Amazon Alexa to control in one action. Go to the Alexa app and select Routines, click on the plus button to create a new one. The first step is to select the trigger so tap on Voice and then enter the phrase you want to turn the lights on e.g. Start Christmas. Then tap on the Add action button and select Smart Home. You can then select Control device and pick your smart plug from the list and have the option set to On. You can then add an additional plug. If you have smart lights like Philips Hue you can also add them into the mix. You can also create a routine to turn off the lights, I called mine “Alexa, cancel Christmas” and have it turn the lights off. The setup is the same as the routine to turn them just with the Off option selected. If you want to take it to the next level you could also get it to play your Christmas playlist at the same time.